Urbasm: Your book talks about increased repetitions as the goal to constantly improve when using kettlebells. Are there other ways to make kettlebell movements more difficult, besides more repetitions? Urb: Is there a point when more repetitions become too many? and when will a guy know it is time for heavier kettlebells? SC: More repetitions equal more endurance emphasis. If the goal is to maximize endurance, then more repetitions is better. If the goal is to emphasize strength, then repetitions should be kept lower and use heavier kettlebells. While there is no absolute measure of when to increase in load, one guideline that is often used is 10 minutes. When you can do an exercise for 10 minutes without stopping, the next step is to either increase the speed (rpm) or increase the load. For inertia-based exercises such as swing, clean, press, push press, jerk, less than 30 repetitions is considered low reps. Since kettlebells is primarily an endurance exercise, aim to first increase reps to 30 or more before moving to heavier loads. Urb: Would you recommend choosing particular dIays/weeks to do all kettlebell training, or always mix it in with other forms of strength training on the same day? SC: This ultimately depends on a few individual factors: The goal of the exerciser (weight loss, or increasing strength, or supplementing athletic goals, as well as the schedule and availability of the individual). For most users, kettlebell training can be the centerpiece of a well-rounded exercise program and may serve as a stand-alone tool and method. 3 days per week of kettlebell training as a minimum is recommended. More experience and/or fit exercisers may increase to 4-6 days per week. Kettlebells may be combined with other methods such as barbells, bodyweight exercise, suspension training, medicince balls, running, stretching etc, or can be performed on alternate days (e.g. Kettlebell training on M, W, F and Barbells on Tu, Thurs for example). It’s versatility allows for any combination and there is not one set way to schedule them. The more intense the exercise workout (total volume), the less variety one will do in that given workout. Urb: If a weekend warrior would only add three kettlebell exercises to his normal routine, what should those be and why? SC: One, Swings – This is foundation movement and is an excellent full-body conditioning exercise which simulataneously combines, cardiovascular exercise, strength building and mobility. Therefore it is a highly efficient use of time. Two, Clean and Press – This combines both pulling movements (exercising biceps, back, traps, hamstrings, gluts and grips) and pushing movements (exercises triceps, deltoids, abdomen). Three, Squat – This develops leg strength and power as well as improving basic function of the hips and lower body musculature, with a high correlation to many daily activities and athletic movements. Urb: Is there a body part that can’t be reached effectively using only kettlebells? And what muscles seem to respond most favorable to this form of training? SC: Of all areas, the chest muscles are least developed when using kettlebells alone. To develop the chest more fully, horizontal pushing movements (e.g. Bench or Floor Press, Pushups) and pulling movements (Bent Rows, Horizontal pull-ups using a Suspension training device such as TRX). The muscles most favorably developed by kettlebell training are the legs, deltoids, triceps, back, forearms and cardio system (heart and lungs). 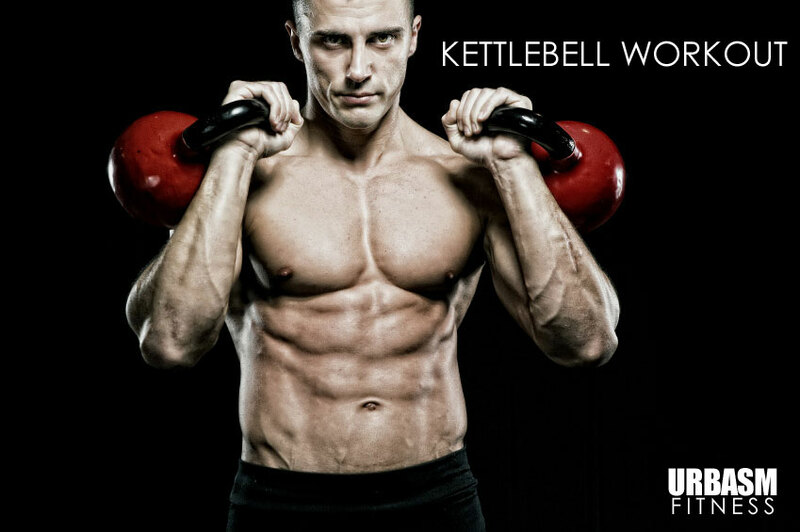 Pecs are not fully developed using traditional kettlebell exercises. Some horizontal work with barbells and/or suspension training units (.e.g. CrossCore, TRX, etc) can easily be incorporated into the training program to give more chest emphasis. Glutes, hamstrings, forearms, triceps, deltoids, calves, back/lats and quads are the areas that respond most favorably to kettlebell training. Kettlebell Training is written by Steve Cotter, the founder and director of the International Kettlebell and Fitness Federation (IKFF). Cotter consults with numerous professional sport teams, including the Texas Rangers. Kettlebell Training is now available in bookstores everywhere, as well as online at HumanKinetics.com. Checkout a free excerpt of his book here.